Published 2nd November 2012..sorry a day late! Welcome to the blog that loves world, roots and folk music and helps you enjoy it wherever you are! Bienvenue to the blog that supports Northeast England world, roots and folk music venues! And..welcome to the blog that supports Northeast England Roots Music artists! Why? Because everyone on the world, roots and folk scene together can make a stronger scene and so that we can all find out what’s happening locally cos’ there’s loads going on. 4th edition now out on Soundcloud And now on Podomatic at :.-so you can now catch Newcastle Roots Music Radio in your podcatching software! Every 2nd Tuesday of the month I DJ from 830pm at the said pub playing the very best in World, Roots and Folk Music. Please come and say hello. Next up Tuesday 13th November which unfortunately clashes with Melingo and his band at Sage Gateshead so I’ll be missing that…..The choice is yours. A new format starts this month. There’s a gig planner below where hopefully all the venues in the Northeast will eventually be included.Weblinks to gigs and promoters follow. If you want your gigs to be included please e mail me with all the relevant details including any weblinks…a few MP3 tracks of what you will be playing would also be useful. So that I can give them some airplay on the Podcast/on my NE1Fm show/DJ night hope subject to what’s going on that month. I’ve picked out concerts/gigs that have particularly caught my eye and added some info which may help you make to decide on your “neet oot”. Newcastle’s first African Band “Kilimanjaro”, a group of Africans, musically talented individuals who hail from various countries within that vast continent have been nurtured by the Jumping and Hot Club themselves. The Journal , Newcastle said of them that not only are they pan- African but :” The band, as adopted Geordies, have subtly infused their sound with British and even North East influences”. The gig will be a good place to use those dancing feet and there will be African DJs to support the gig. Award winning folk band the Demon Barbers in dance off ! “The Lock In sees a group of street dancers in a dynamic dance-off, bringing together the UK’s top clog, sword and Morris dancers with their counterparts from the worlds of B-boying, popping and krump. Meanwhile, house band The Demon Barbers take English folk on a new journey through hip hop, funk and ska and even burlesque!” according to the Lowry, Manchester prior to the show there. Having seen the sheer energy, rhythm, and daring do of the Demon Barber road show which challenged the conventional ideas around morris this is one not to miss! Here’s a taster of what you could miss! Argentinian Tango artist Melingo brings his gravelling characterful voice to Sage, Gateshead having recently put out the stunning album. His website says this of him; “To be Melingo, one must walk the streets sniffing out poetry like a bloodhound. One must dance like a whip and sing like a scar. Melingo is (a)major musician. He studied at a Conservatoire but retains little of that institution. He was - and always will be – a furious adventurer, fevered, hallucinating.” Such passion will be reflected in a tango fuelled night at the Sage! The King of Western Swing Bob Wills and his Texas Playboys may no longer be with us but The Hot Club of Cowtown sure can kick up a storm! The Austin Trio play with immense aplomb, energy and humour, they do cover Bob’s tunes as featured in their album “What Makes Bob Holler” and other trad material but will also cover Tom Waits and cite Gypsy group Taraf de Haidouks amongst their influences. Take your pardners for a real good Austin TX night! North Carolina based American singer Tift Merritt brings her band with her for this very special night. Tift who released her debut album Bramble Rose in 2002 brings her brand of alt-country to the Cluny with a new album in her pocket Travelling Alone. I find Tift’s songcraft varied, easy on the ear and there’s a good southern laid back feel there. Your night out is in safe hands with Tift. See the gig guide and venue planner for dates, getting to the gig, tickets…..
With Christmas coming why not bestow these on your folkie/rootsy/worldmusicy friends! The Rats: “Between the Wars”: I have Folkcast (www.folkcast.co.uk) a great podcast, to thank for finding out about these Aussie celticpunkfolkies with their nautical tunes! Their MySpace page (http://www.myspace.com/between.the.wars ) says the album tries to: “and capture the energy and fun of their live show”. It certainly does me hearties! These Newcastle based fellows, nurtured in that crucible of good ale and fine music, the Cumberland Arms, Byker, Newcastle, are a six piece combo presenting an engaging foot-tapping, swing filled, humour bathed mix which takes you back to the bluesy old-time jazz days! But they are so much more than that. The opening track takes you down to the Byker bayou with the refreshing taste of Cajun in “Danse de La Limonade” . You find yourself listening to a crackly old 78” in the “Great Fire of Byker” (which it was, as I saw it..!). This historical ditty recounts the great inflammation of “Shepherd’s Scrap Metals” thus preserving that event in musical history. But this CD ain’t destined for the scrapyard. Rob is able in his old time voice,born in that speakeasy of the county of Cumbria, to lead us in a bit of money orientated wisdom in the title track which packs one hell of a swing! The boys don’t fight shy of the banking crisis including some choppy rhythms, tuneful whistling, and mandolin picking courtesy of Tom Cronin. “Hot Bath” has a lovely swinging feel with great call and response chorus and some nice tinkly old time piano! If the many excellent tracks of this album leave you feeling a bit overpowered it’s probably because you’ve got “The Hangover Blues”, the album’s penultimate track. This lament’s humorous lyrics which provide good health , are delivered in expert style by the adroit Mr Heron. We leave Rob, Ben Fitzgerald (guitar, vocals),Tom Cronin, Colin Nicholson (accordion, vocals), Rob Blazey (double bass, vocals) and Dav Shiel (drums, vocals) swinging us out shabadabadoing, finger picking, double bass twanging their way into a very promising, entertaining start to what will be the first of many albums. By the way, they are also excellent live, and a fine set of fellows! 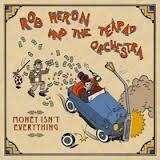 More info at: http://www.teapadorchestra.co.uk/about-us.php and a further review at: http://www.nodepression.com/profiles/blogs/rob-heron-and-the-tea-pad-orchestra-money-isn-t-everything . Why not treat your beloved or your mate or yourself to some Newcastle Old Time! Go to the band’s website to grab yourself a copy or via I Tunes.